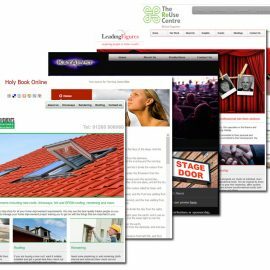 When I added a websites section to my blog I always intended to showcase sites that I found interesting or useful. 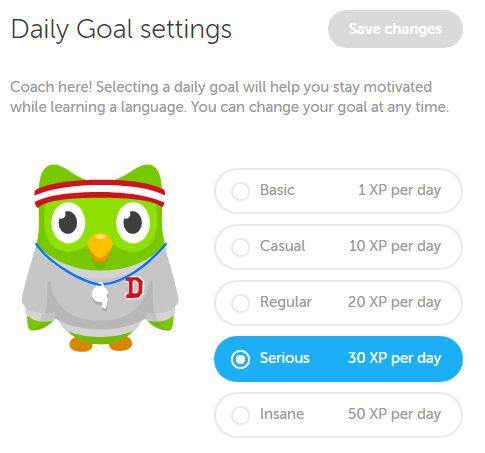 Today, I would like to walk through a website called Duolingo that helps language students keep their skills fresh. 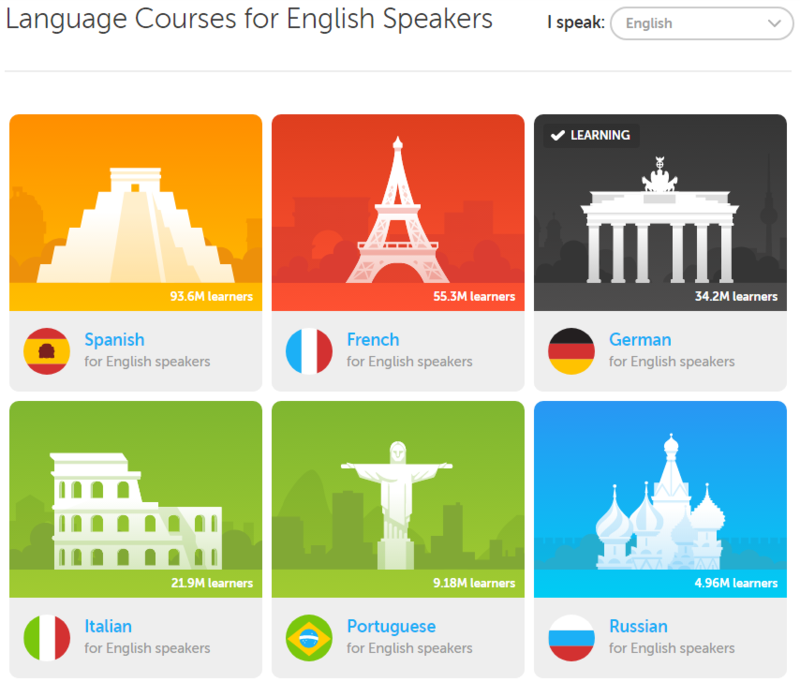 The site can be found at https://www.duolingo.com/ or on a mobile device using the respective application store. 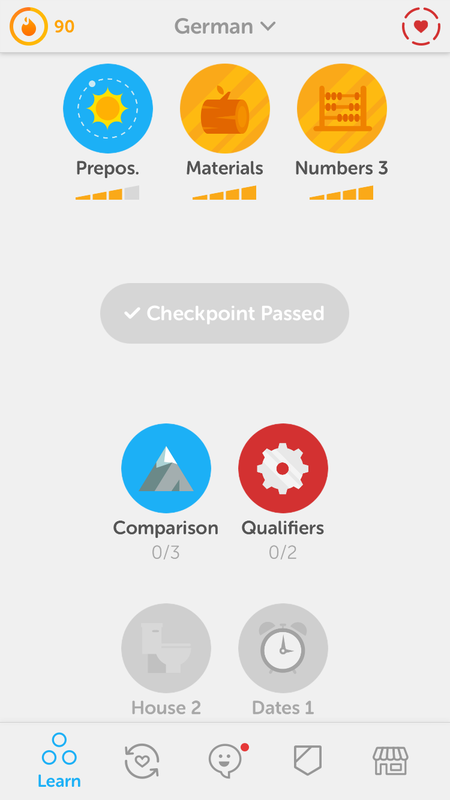 Four months ago, I thought I would see if I could learn a language from scratch just by using the Duolingo website and mobile app. In the past, I have learned a little French and Spanish so I couldn’t use them. 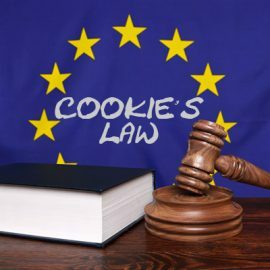 It was a friend from Romania that pointed me to the site so I thought I would try Romanian but when I tried to use it on my mobile phone, Romanian was not yet available so I chose German which was. After selecting the language, you select a daily goal, which is how much effort you intend to put in. These range from Casual (1 skill practice session per day) to Insane (5 skill sessions). 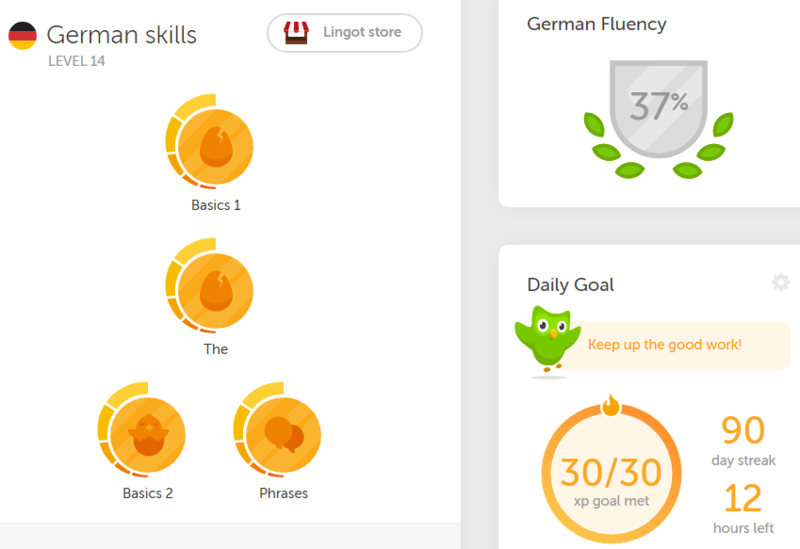 I opted for Serious (3 skill practice session per day) as I was serious about attempting to learn German. There is a Basic level but I don’t know what criteria that uses. You can change your daily goal from the settings section but I’ve always kept mine at Serious. Each time you complete your daily goal you get a day added to your streak. After 10 continuous days you earn a lingot (Duolingo currency) but more on that later. 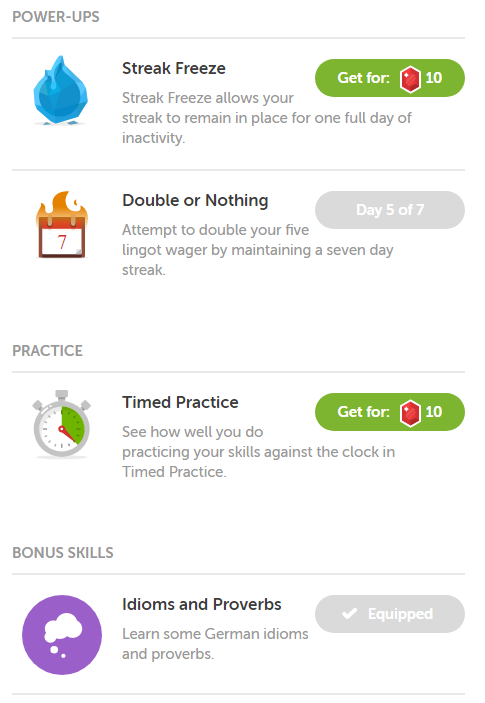 After 20 continuous days you earn 2 lingots and so on. Each skill is made up of one or more lessons and you earn 10 experience points for completing a lesson. You also earn 10 experience points for strengthening a session. You cannot strengthen the skill until you have completed all of the lessons. Skills are learnt by completing lessons and fortified by strengthening practice sessions. My first streak was on 35 days and then I went away for a day but forgot to complete my 3 skill sessions on my mobile phone, so the streak went back to zero and I started again. Now on 30 June 2017 – I’m on 90 days and just earnt another 9 lingots. There are probably others but these are the main ways; listening, repeating, translating, seeing or matching and selecting. There are two types of achievement level; an Experience Level which is judged on the amount of effort you have put in and Fluency Level which is judged on the amount of skills you have learned and your accuracy. I am currently Experience Level 14 after completing 125 days with roughly 30 sessions a week and my Fluency Level is 37%. The skills start off easy and become harder as you go through the levels. To start with you will have to complete “Basics 1” no matter what language it is and then that unlocks the next level of skills, which in this case for German is “The”. As you complete a skill it will usually turn gold and show 5 strength bars. However, before you complete a skill it will not show any strength bars but will show how many lesson there are in total (on the right) and how many you have completed (on the left). 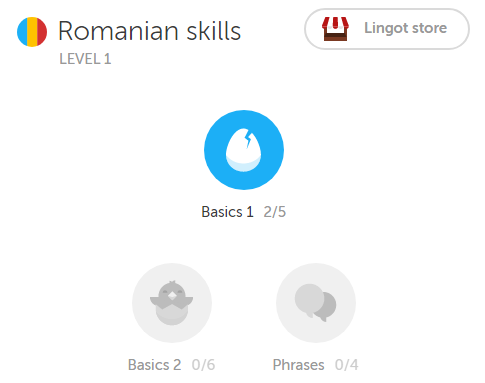 As you can see in the Romanian skills image, The “Basics 1” skill only has 2 of the 5 lessons complete so it is not gold and the next level “Basics 2” and “Phrases” are locked. There are also checkpoints throughout and if you are already experienced in the language you can “test out” for the checkpoints to move yourself along more quickly to the harder skills. 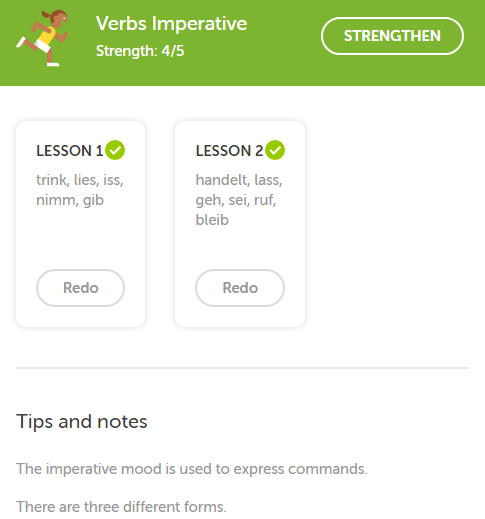 In the image below you can see that I’ve completed both lessons for “Verbs Imperative” but I now need to strengthen that skill to get from 4 strength bars to 5. You can also see that “Verbs Imperative” has some “Tips and notes” to help explain the skillset language rules. Not all skillsets have these tips. Lingots are the Duolingo currency and can be used to purchase things in the Lingot store or used in other places in Duolingo. In the Lingot store, you can choose to freeze your streak (never done but wish I had on my day out) or double or nothing (which I have done several times to increase my lingot wallet). I’ve never tried the timed practice but have purchased two bonus skills for 30 lingots each. There are other sections such as a word list, discussion forum to practice or ask questions of other students and a labs panel too that shows any experimental projects. I won’t cover these here but I use the word list a lot as you can check the words that you have learned, their meaning and your strength in them. You can also invite friends and if they take up the challenge you can monitor each other’s progress on the leaderboard. 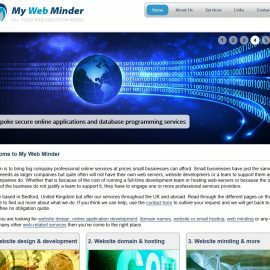 There are many languages on the site now, see Duolingo courses and more they are working on or are coming in the future to both web and mobile. It’s amazing that nearly 100 million people are using Duolingo for Spanish language learning which is by far the most popular. What they could do is show all the words for the skills you have learned. I don’t know how Duolingo decides which words to add to the word list but it does not always contain all newly learned words from a lesson and practicing a skill shows only some of the words you have just practiced. Still I have found the word list very useful, especially for determining gender which, until recently, wasn’t shown whilst strengthening skills or completing lessens. I was previously maintaining my own gender list of nouns in Excel. They could include a spoken practice of the sounds of the alphabet, which I went through with both French and Spanish as a beginner but there’s nothing like that on Duolingo. Alternatively, an oral only practice section as you can turn off the spoken side during skill practice if you are out and it’s inconvenient to talk but cannot perform a speech only session to strength the spoken language skills. The only issues I’ve found was with Flash on some browsers, which is needed for the spoken bits. I couldn’t get it to enable the microphone to work on Firefox or Internet Explorer but I found the right settings in Chrome so use that now. Finally, I would also appreciate having the British English word spellings rather than in American English, but I can live with that. Duolingo is great, easy to navigate, gamified and free to use. It is paid for by unobtrusive advertising. When you complete a skill or strengthen a skill, you see an advertisement at the end. There are no annoying popups, no watching advertising videos for a certain amount of time before you start learning, so that’s a big bonus. I think that I have got further in German using Duolingo than I expected in the last 4 months. Form knowing nothing at all to understanding the basics. I don’t quite feel confident that I could hold a conversation in German but feel that it won’t be long now. Forcing myself to practice every day even if I am tired for 15 minutes (3 x 5 minutes sessions) so I can maintain my streak really helps to keep me focussed on practicing every day, which is what you need to succeed in learning a language. I am about a third of the way through the German course and when I’ve completed it I shall visit Germany to try out my new language skills and see how I get on.